In 2008, to officially acknowledge the centenary of Sir Donald Bradman’s birth, the Australian Government provided a $6.5 million grant to the Bradman Foundation to establish The International Cricket Hall of Fame within an expanded Bradman Museum. With the objective to engage, inspire and educate as the driving force behind the project, The International Cricket Hall of Fame extension opened in late November 2010 and ensures that Sir Donald’s legacy will remain accessible and inspirational for generations to come for all Test Playing Nations. “It is a major milestone in the history of the Bradman Centre which includes Bradman Oval at Bowral should become home to The International Cricket Hall of Fame. “Bradman Oval has always been viewed as the spiritual home of Bradman as it is the scene of Don Bradman’s early triumphs, and now that home is enlarged and enhanced by a splendid new building,” said former Chairman of the Bradman Foundation, Mr Michael Ball AM. Bradman Foundation, a non-profit charitable trust, was established with the full support of Sir Donald Bradman AC to promote cricket though the museum and its programs as a valuable cultural and sporting force within the community. The Foundation remains dedicated to honouring the contribution Sir Donald Bradman made to the game of cricket during his lifetime and bringing his vision – to encourage and inspire young people to serve their nation with courage, honour and humility – to the world’s cricket community. 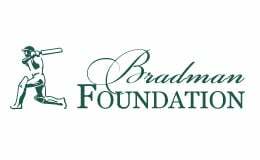 Find out more about The Bradman Foundation.